Jaakko Tähti is to be congratulated! For completeness of the records, part of the Minnesota halos of 3rd January 2004 are shown here. The top image is 'as was' from the camera. Bright left and right hand 44° parhelia were visible in the display. Thanks, Les, I add that in the list. Patrick sent me also at least one very likely observation that I was not aware of. One more thing, Les, who is the photographer? 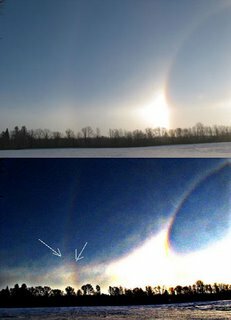 Thats unusual I thought that 44 parhelia were a rare halo I hope to see one of those myself but right now its too warm for diamond dust.